I am sad. 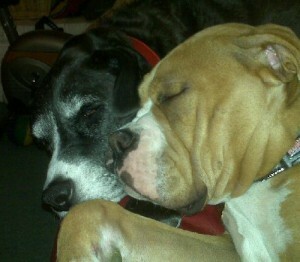 Rocco is not well, he seems to be declining. His sight in his good eye is failing. He can still see, but not very well. When he tries to concentrate on something his eye doesn’t seem to want to cooperate. When I take him for walks he crashes into stuff, and when we play bubbles he can hardly even see them. He goes after the ones on the grass, because they are not moving. He is eating fine, he can get around fine, he seems to be going potty and all those sorts of things fine. I just see him struggling with his sight now, and is afraid to do things. Even on our walks, he just doesn’t seem as happy go lucky as he has always been. Every noise freaks him out, its just so sad! Everything he loves has been taken away. He cant play with the soccer balls, or any toys really. He cant even enjoy the walks anymore. He just lies around. I have to go to work each day so he just lays there on the couch. He doesnt run up and down the hill chasing squirrels, checking out the yard, he just doesn’t have interest in it anymore (probably because he cant see! ).Well, It is heart-breaking. This is all happening too fast! I get one thing sort of under control, and then a new problem arises. I just wish there was something I could do to slow it all down a bit. I’ve been taking him for rides. 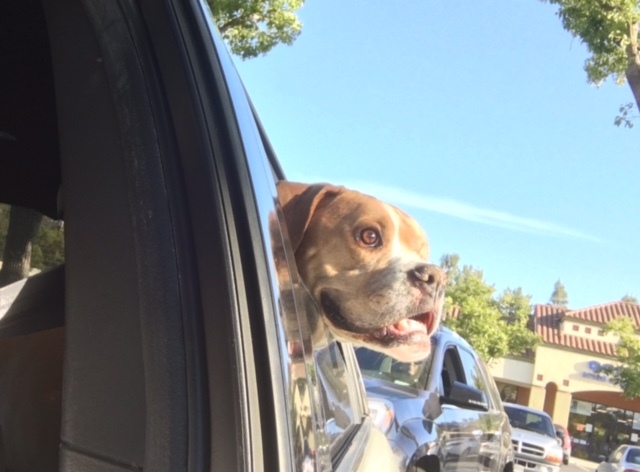 He still loves to go in the car. I took him to In-N-Out the other night, and of course got him a cheeseburger. He loved both! I have been feeding him lots of good stuff (maybe not good for him, but he loves it). Wet food so he gets some doggy nutrition, then I give him boiled chicken covered in turkey gravy, or fast food burgers, tapioca pudding, all sorts of soft stuff like that. Every once in a while he goes over to the toys and acts like he wants to play! He has this one squishy yellow ball that has been one of his favorites for a long time. We played kick ball with it the other night. He had fun! It was a little spurt of energy and ‘Rocco’ was back for a few minutes. The vet said that once his sight starts to go in the good eye, that means that the tumor is either working its way up into the brain or over to the other optic nerve. We all felt like this was going to be months away, but its all happening so fast! I don’t think he is suffering. as in pain, but he is suffering in that he cant play, he cant go on walks (well, he can, but its not so fun). He can however, sit on my lap & get lots of love. Im afraid the end is near, but how will I know when to allow it to happen? The rest of his body is very healthy – its just this stupid cancer that’s the problem. You can see the growth on the left cheek. I have been trying to feed him more so he can gain some of his weight back. Not that he is too skinny, but I can feel all his ribs and spine – where before you could, but they were not so obvious. Anyway, the vet said to feed him more, and fatten him up a bit. So we are doing that! I give him half a can of wet food with his medicine crushed into a powder on top of the food. Mix it up a little. So he eats that. Then I give him a little Freshpet refrigerated chicken soft food and real boiled chicken, topped with turkey gravy! Oh my gosh, he loves it! For snacks, I give him cottage cheese with pumpkin stirred in, or doggie ice cream, rice pudding, or whatever else I can think of. My husband brings him burgers every few days as a treat and of course Rocco devours those! We’ve been going for out walks like normal. He seems to have trouble seeing things right in front of him. I am not sure if now the other eye is having problems or if its just his depth perception and he isn’t paying attention. But he has almost run into fire hydrants, mailboxes, etc. So I now use the leash to guide him along the sidewalk and warn him of an obstruction. He seems fine with it – hasn’t hurt himself, but I don’t want him crashing into things – that’s embarrassing for him! I took him to the carwash and he had a great time there. Got to talk to some of the guys who work there (there are many dog lovers), and check out some new smells. He has been sleeping well, but has been having more tremors. They usually happen in the middle of the night, or very early in the morning. The vet said it could be many things causing them. He could be cold, he could be in pain, having anxiety, or it could be the start of kidney problems, or Addisons. The vet thinks it is probably pain. But he could also be cold. We dont keep our room super warm. So if he starts shaking, I cover him up and that seems to help. I am not sure if its the blanket helping, or if the mommy love makes him forget about whatever is hurting. Regardless, for now, covering him up and cuddling seems to help. My poor little guy. I hate that he is suffering. Took Rocco to the vet today. Just for a evaluation / recheck sort of thing. He said the tumor is obviously growing, and its going to be more and more uncomfortable as time goes on. He thinks that some of the muscles/nerves on the side of his face are affected and that’s why his jaw hurts so much. Neurologically he felt like Rocco is doing great, so he doesn’t think that portion of the tumor that they left in there has grown up further into the brain. He said he was not showing any of the typical issues of meningiomas in the brain, so that was good news! He said he was alert, could concentrate, was looking to him for cues, was walking normal, and acting as he should. He told me to watch for seizures – because once they start there are medications he can have to keep them from getting too bad. I hope that happens way in the future, if it does advance to that point. He was a little concerned because Rocco has lost over 8 lbs in 2 months. So he is not eating enough. He told me to feed him more often, and give him anything he likes. I know it hurts sometimes when he eats, so thats why he doesn’t just gobble everything down like he use to. I have been feeding soft foods. I have eliminated dry food, dog treats, cookies (kills me because he loves the pumpkin cookies), and pretty much just giving him soft cheese, tiny pieces of chicken, wet food, cottage cheese, dog ice cream, goats milk… I need to find more options for him. Wiped out Rocco. Pain pills are coming! I have Rocco back on Rimadyl, which I think does help him feel better. We took him off of it for about a week because he was acting strange. But the vet said its better to keep him on it, and even give him pain pills – if we keep the pain away, and keep a constant flow of the meds – he will feel better overall. Makes sense. I haven’t been great about making sure he has the pain pills. In fact, I have only given him the Tramadol once. He said I should give it to him regularly and that will help him be more comfortable. He says his jaw/cheek probably aches constantly, but there is no way for him to tell us. He cries if he yawns, or opens his mouth wide, so that pain is obviously worse. So I am going to keep him on the Rimadyl and the Tramadol and see if he feels better. He has had some mild tremors lately, too. 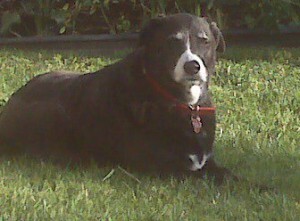 The vet said there are many reasons dogs have tremors, but usually its because they are in pain. So that points again to giving him the pain pills. He said I can grind them up and put them in food. Its getting harder and harder to get him to eat the pills. I cant just throw them down his throat because I am afraid I will hurt him. My poor little guy. I feel so bad! He is such a good boy, I just want him to feel better!!! I am a little worried about Rocco (more than before). He has had this odd behavior lately. I dont know if its from the Rimadyl (thats the only medication he is on) or if its the tumor affecting his brain. He will look at his toys, and I can tell he wants to play with them, but is afraid it will hurt – so he wont! I did reduce the Rimadyl dose, thinking that he would feel a little more like himself if he wasn’t so doped up. It’s funny, Rimadyl is only an anti-inflammatory, but he just kind of has this odd behavior. He lays there staring off into space. He will run outside and stand on the patio and just stare off into space – then come running in like something scared him. This morning he acted like he was afraid to go outside. I went out with him, he went potty and then ran back in the house. He got up on the couch ‘behind’ me! He doesn’t normally do that. Normally he checks out the backyard for a while, comes in and may lay on the couch, but today he was acting strange. I finally got him to relax and he had some breakfast and laid in his normal spot on the couch. I had to go to work, but I felt better about things when I left. Last night he was stuck to me like velcro. If I got up to go to the bathroom, he came with me. He stood right next to me as I washed the dishes, and as I folded the clothes from the dryer. He isn’t acting like he is in pain, its just like something is bothering him. Almost like he is afraid of something. behavior changes. I love Rocco so much, I don’t want him to suffer. I want my crazy puppy back! I want him to be healthy and happy and everything he was before this all started. It’s me Rocco! Please pray for a miracle! Rocco is not in any pain that I can tell, but he is acting kind of doped up. He lays around and kind of stares off into space. He goes outside and just stands there. He does still bark at things in the yard, and gets excited when its time for walks, gets excited when people come home, etc. All he is on right now is Rimadyl. He was on it prior because of his surgery and I didn’t notice him acting spaced out at that time. He also keeps crashing into things, which is not like him. Yes, he only has one eye, but has adapted well to that. His close up depth perception was a little off, but I had not noticed him crashing into things until the past few days. I think I am going to discontinue it for a few days to see how he is. I am not blaming the Rimadyl yet, it could be the tumor. There is part of it still up right under his brain and it could be growing and could be causing the problems. If I take him off the meds and he goes back to his old self, then we will discontinue it. If he acts the same way off the pills, then I may put him back on. I do know that there are side effects to Rimadyl. No medicine is perfect. As I have been saying all along, I want him to have a good quality of life – for however much longer he is with us. So if not being on the meds makes him happier, and able to have more fun, then so be it – the pills will be done with. He is only 6, I should not have to be making these decisions now..
We have started giving Rocco hemp oil, not the type with the THC in it, but even this type is suppose to help. He doesn’t really like the taste, which surprised me. So I am just giving him a tiny bit with each meal until he maybe gets use to it, or doesn’t mind it. 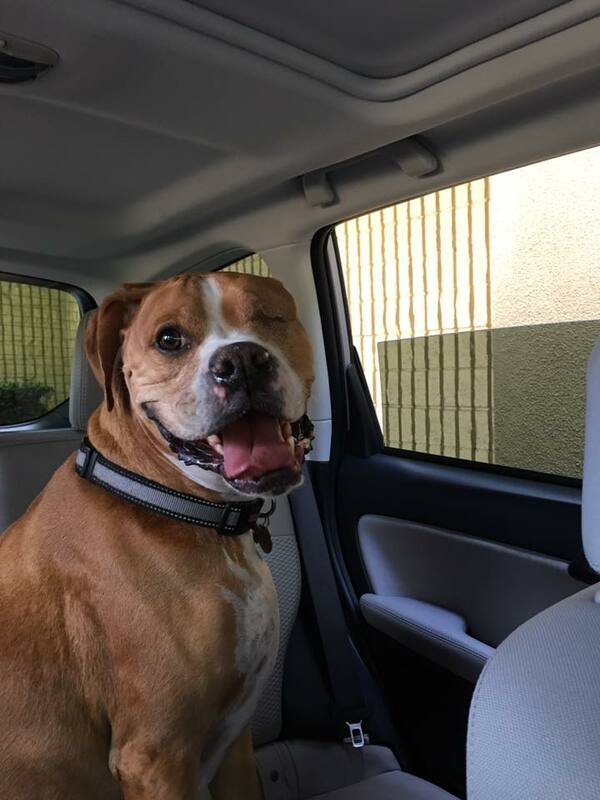 Rocco went with us through the drive through. He loves the car! All of these things sound great. I think it will be a great addition to his food. I also give him about 6 ounces of raw goats milk a day, and he takes his antiinflammatory meds each day (twice a day). I think he is actually feeling a little better. He seems more playful and is sleeping really well. I have been adding boiled chicken to his food. He loves it. I just want to spoil him. If he is uncomfortable at all, I cant really tell. But he loves to eat – so I am doing what I can to keep him as happy as possible and food is one way I can do it. We have also been going for rides in the car a lot, and going for walks. 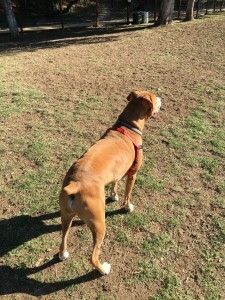 He even got to play at the dog park a few times in the past week or so. I cant figure out how to post videos on here. 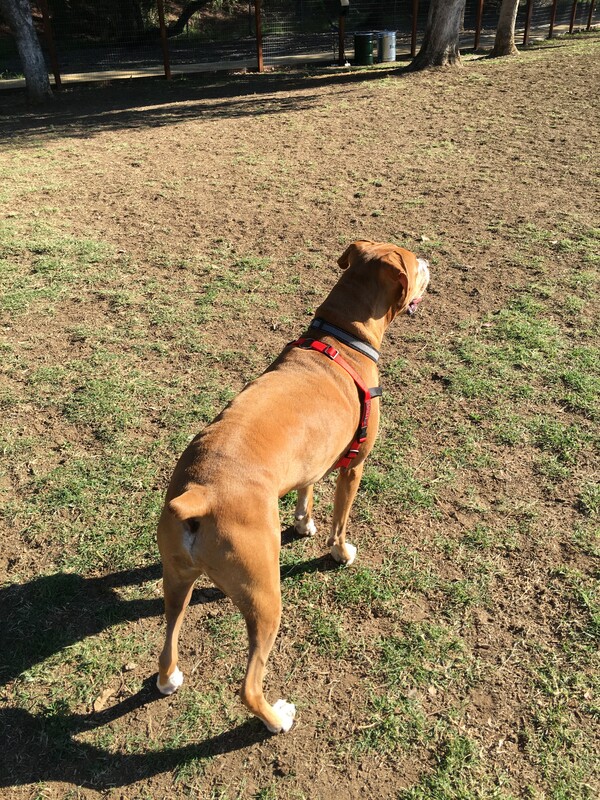 I have some great ones of him playing at the dog park (we only go when no one is there). CLICK HERE TO VIEW one of them. He just loves running around sniffing all the trees and ‘marking’ them. He is such a great dog. Hope we get to have him in our lives for quite a while longer. Just realized is birthday is next week. I want to have a birthday party for him!!! I spoke to two local vets that I trust and we have decided to hold off on the Prednisone. He is doing well right now, and we are going to give him Rimadyl instead and see if that’s enough to keep the inflammation down. They both felt that there wasn’t any proof that Prednisone helped with his type of tumor and that the risks of the side effects outweighed his quality of life at this point. 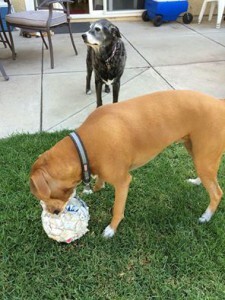 Back in the good ol’ days when Rocco would bring his balls with him everywhere. Rimadyl may help him get back to that point. We know the cancer is going to keep growing, we know that its just a matter of time .. but for now he is feeling good! He eats, sleeps, plays, acts normal. We go for hikes, he runs around chasing squirrels, jumps for joy when we come home, etc. The only time it seems to hurts him is if he yawns wide or picks up a large toy. Once things start going downhill, I will start on the prednisone to keep him comfortable. The vets I talked to felt it was just pallative at this point, and not going to really cure him or hold off the tumor from growing. We have weighed all the options and we just really want him to be happy. So we are going to give the Rimadyl a try and see if that’s enough for a while. I am also giving him softened food and raw goats milk. I’ll keep you posted! Last night we had Nick’s bday dinner and had a few people over afterwards. Rocco was playing with his toys, even chewing on his nylabone!!! Even on the bad side of his mouth. Its after 3 doses of the Rimadyl. I think its helping!! I was so happy when I saw him chewing the bone. I hope this helps him for a while. I am definitely not ready to let go at this time. I am a little leary of the Prednisone. I have been doing a bunch of research and many of the side effects are pretty bad. Rocco is suppose to go on it long-term, for like the rest of his life. Short-term use seems fine, but everything I am reading says that anything longer than a month or so, that’s when the side effects start to show themselves. There were some others, but those really bug me. I don’t want the rest of Rocco’s life to be miserable. I would rather not do the steroids and let him be happy as long as he can be, comfortable, and able to relax and enjoy himself. He had one dose last night. About 2 hours after the dose he passed out and never quite came back to normal until this morning. I dont want that either! So for now – no more Prednisone. I have it, so if we decide to start with it, its available. A friend of mine suggested giving Rocco raw goat’s milk. She shared an article which toted raw goats milk as a great nutritional food, as well as a potential medicine for certain ailments in pets. 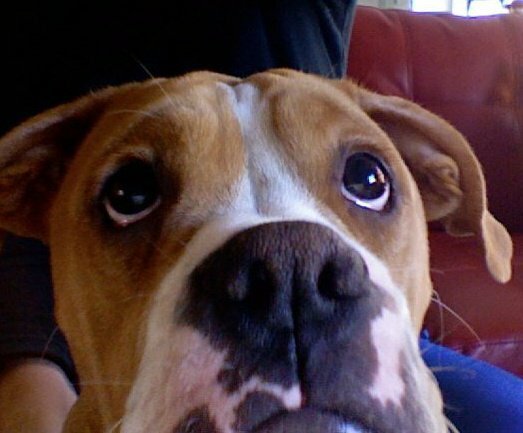 Puppy Rocco. Look at that sweet face! Wish I had given him raw goats milk all along! I decided to do some research. Found quite a bit of good info and thus have bought some goats milk for Rocco. He LOVES it. I just pour it over his food and he devours it all. Will I notice a change in him? Who knows? Will it help keep the tumor from spreading? Who knows. Will it make him feel better? Who knows. But its making him happy and at the moment that’s my goal. According to the Journal of American Medicine, “Goat milk is the most complete food known.” It contains vitamins, minerals, electrolytes, trace elements, enzymes, protein, and fatty acids all utilized by the body with ease. In fact the body can digest goat’s milk in 20 minutes. Having fat molecules one-fifth the size of those in cow’s milk makes it easily digestible and tolerable to those with compromised digestive systems. says Answers Pet Food. According to Loyalbiscuit.com and IBPet, Regarding Raw Goats Milk and Cancer: Many researchers have found that carotene (or Pro-Vitamin A) contains cancer preventing properties. The milk fat in goat’s milk contains a higher evolved carotene that is readily available for the body to absorb. There is also a fat in raw goat’s milk, called conjugated linoleic acid (or CLA), that is known as the cancer fighting fat. CLA has actually been shown in some cases to shrink cancer tumors. Read similar info on many sites, including A Place for Paws – they say: Raw goat’s milk contains both anti-mucous and anti-inflammatory properties. This makes it a perfect supplement for dogs who suffer from allergies of any sort, including food and environmental allergies. Raw goat’s milk can help to make the steroids that you are forced to give your pet a thing of the past. As a natural anti-inflammatory, you can be certain that the side effects of drugs such as prednisolone and cortisone will never be an issue. Rocco at the park! One of his favorite spots. So yesterday was rough. 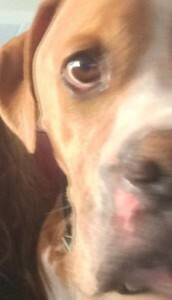 We found out that Rocco’s tumor has returned. It’s spread to his jaw. Poor guy! Yesterday I was told the to call and speak to the oncologist (who is in the same building as the surgeon). She spoke to the surgeon and got to see Rocco yesterday while he was there. Ok, so anyway, I called to talk to her. I was told that I cant talk to her. I must make an appointment for an exam and consultation before she will share her ideas. Why? She already saw Rocco, already had a discussion with the surgeon. She probably wants me to try some new experimental drug or she wants to talk me into chemo/radiation or something. I am not going down that road. The cancer has already spread. I know what that means. I dont want to put him through a bunch of treatments that will make him feel sick. Right now he is fine! His jaw is a little sore, but other than that he is doing great! We have decided to just keep him comfortable and as happy as possible for as long as we can. The vet wants him to try steroids to see if that will halt the growth of the tumor, so we are going to start Prednisone in a few days. I just hope the side effects aren’t horrible. I know that it increases appetite, thirst and the dogs pant a lot, but hopefully that’s it. The surgeon is also suggesting pain pills, which he doesn’t need yet, but may need if the tumor grows. It will be good to have them ready if he needs them. I am going to go after work to find raw goats milk – heard its great for dogs! The tumor has returned. Poor little Rocco. He is such a good boy, and I love him so much. I cant believe the tumor grew back so quickly! I hate cancer! Here is what has happened in the past few days. Over the past several months, Rocco jaw has been sore. It seemed to have never healed from the surgery. He has been taking Rimadyl for it, and I think it takes the edge off. The last month or so, however, he has been more uncomfortable. 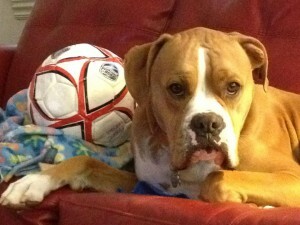 He no longer plays with his soccer balls (well, he tries, but when he opens his mouth wide, it hurts). So he would rather not. It hurts when he yawns big, or gets excited and goes to grab a big toy. Its so sad, he whimpers and looks at me to ‘fix it’. Oh how I wish I could. We finally decided to take him back in, it seems like its getting worse and I feared that the tumor had returned. My husband thought it was tooth related. So anyway, I made an appointment to go see the surgeon who did the tumor removal. I was going to go to his normal vet, but they missed the cancer in the first place, and I didnt really want to have to explain everything that the surgeon did – I decided I would go right to the person who actually knew what all had happened. So anyway, finally got an appt for today. We went this morning. The surgeon is really nice, and completely remembers Rocco. He told me that it felt like there was a mass there. His eye socket was hard and it should not be. So he said we could do a catscan or a ultrasound. Ultrasounds are much cheaper and he felt like he could see enough with the ultrasound to see what all was going on. He said it could be an infection/abscess, cyst or a tumor. He wanted to do a biopsy on the tumor (if it was one), but I told him not to. We are not going to do another surgery. The last one only kept the cancer away for a few months. Not putting Rocco (or us) through that again! So I went to work and they kept Rocco there. About 2 hours later he called me with the bad news. It was definitely a tumor. He said he could see the edges and he said it looked like the old tumor, and it was a crunchy tumor (whatever the heck that means), and thats why he remembered it. There is a little good news, the tumor is on the tmj or near it. The tumor is not near any organs, not in the nasal cavity, not near the other eye or going towards the brain. 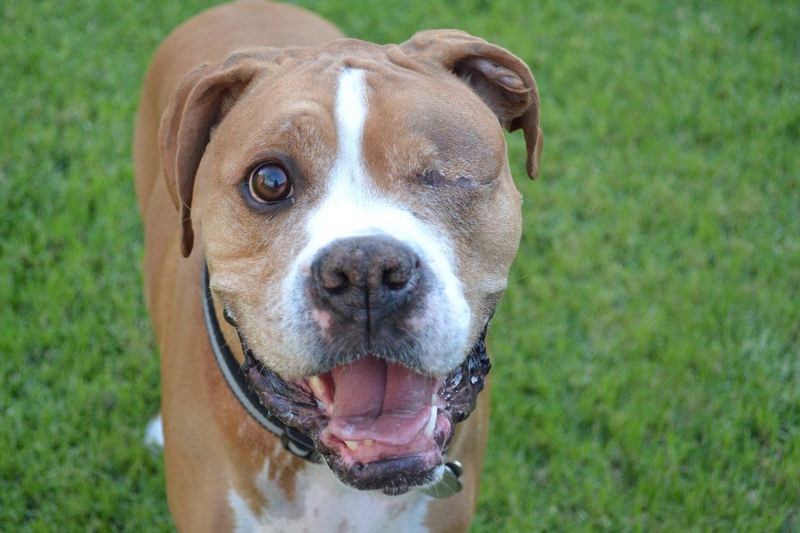 (he still does have some of the original tumor up in the brain area – that has not grown). So even though the jaw area is painful, its not deadly to have the tumor there, as long as it doesn’t continue to grow so quickly. If we can keep it from growing, then Rocco will have some discomfort, but we can control it with pain meds and anti inflammatorys. He wants me to talk to the oncologist tomorrow to see if they recommend steroids, or anything else to help keep the tumor from growing. So that’s where we stand. Right now we are doing nothing. Rocco will just go on as he was before. The tumor hopefully will stop growing and he can live a long time. If it continues to grow at the same pace, he wont have many more months. Once it gets to the brain, things go quick. I have everyone praying for him! Many people love Rocco. Will you please pray for him, too?? 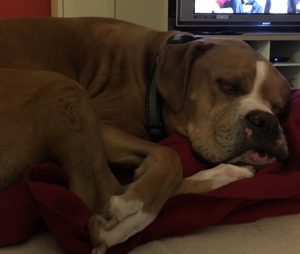 Rocco update: I know more about the tumor now. Here are the cancer details. It’s an optic nerve sheath Meningioma. It is not typically a tumor that metasticizes, so that’s good news, and there is no sign of it spreading YET. His neurological exam was normal. 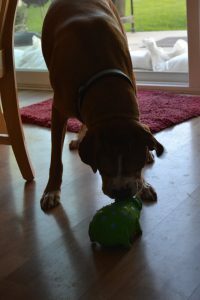 His tumor was sent to a dog cancer specialist on the east coast, and was liked at by a dog specialty tumor board. They said it’s a super slow growing tumor, which is also great news. The portion of the tumor that remains is right under the brain, so it’s a dangerous spot. If it grows up into the brain there is really nothing we can do. If it grows into the empty space that was created when the Tumor and eye was removed, that would be better. It could take years to grow back to the same size, but of course anything is possible. It could start growing really fast, or just stay the same size forever. selfie of the non-pirate side! Treatment options: There is a radiation treatment that could help, but there isn’t much data on it. I guess they only do this specific radiation it UC Davis. Because they left some of the tumor inside Rocco, the radiation will not eliminate that tumor, but it could help slow the growth. But they think its a super slow growing tumor anyway .. I think we are going to pass on the treatment. There isn’t enough compelling data to sway me into making him go through it. Instead I want his quality of life to be the best it can be. I will do my best to make sure he is happy and enjoys whatever time he has with us. The vet seems to think his prognosis is decent. It could take several years before the tumor grows back – or maybe it wont grow back. There is a chance that since the edges have been breached that it could grow back quickly, but they dont think that is what is going to happen. If he starts exhibiting neurological symptoms, that means the tumor has grown into the brain and there is nothing we can really do. Watch for seizures, confusion, sleeping all the time, no interest in anything, things like that. Rocco wants to play soccer! I think he needs a new ball. 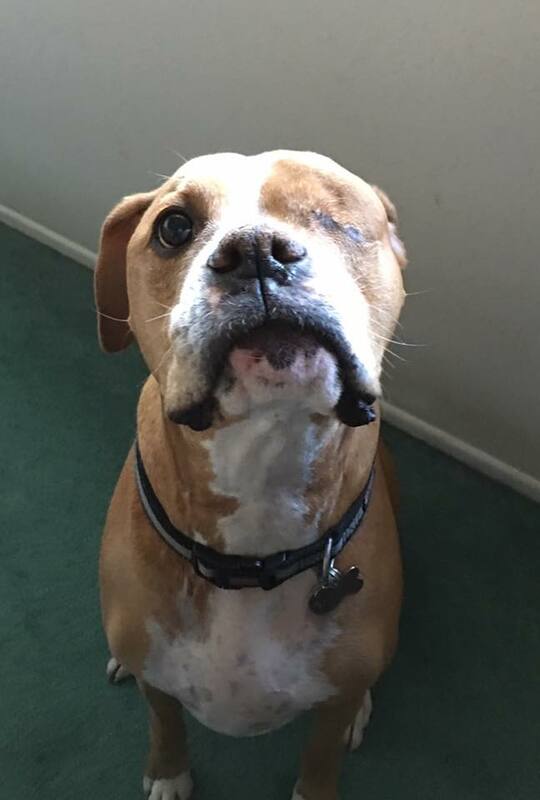 Rocco update: Rocco is feeling much better! He wants to play soccer. 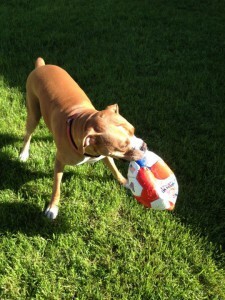 This is the first time he has attempted to play with one of his soccer balls since his surgery. His jaw is sore so he couldn’t really pick it up, but he tried! He cant open his mouth wide enough. I will keep encouraging him to, though, because I think he needs to work that jaw muscle. He has a cloth, stuffed ball. Maybe we can play with that until his jaw feels better. He is a ball kind of guy. He will play with other toys, but his first choice is always a ball of some sort. Chloe never liked balls. She would chase a tennis ball now and then, but would much rather have a stuffed animal. She liked to play chase, and liked rope toys, but never really balls. She treats her toys so nicely. She never ruins anything. She will carry the stuffed animals around, lay with them, just ‘play with them’, but not destroy them. Rocco destroys them! He wants to rip them to shreds. When he was a puppy we use to call him Shredder! Oh, Chloe would try to remove every toy’s eyes, though. She would chew them off. But that was the only thing she would destroy. Our old dog, Chip, loved tennis balls. They were his favorite thing (besides shoes). I would buy the huge box of balls at Costco, and always have new ones available for him. His face would fill with joy as soon as he saw a new tennis ball. He also loved his bed. He would drag it around. 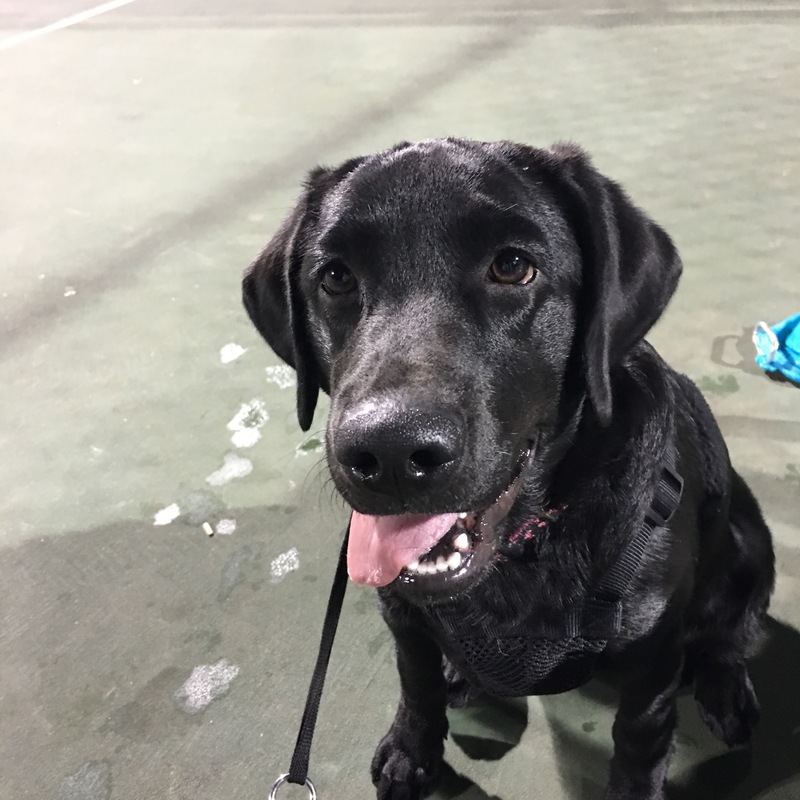 He was a lab/cocker spaniel mix. And he was a very cute dog – looked like a little puppy his whole life! Squirrel? Rocco almost got him! 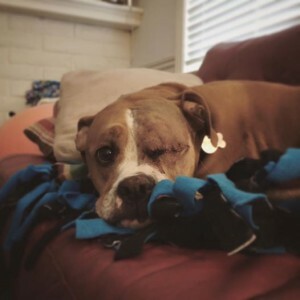 Rocco update: he is doing great! Almost caught a squirrel this morning! No news on the tumor yet. His jaw is still sore, but they said that might take a while before he feels better. He is a happy pup and almost back to his normal spunky self. Just the fact that he saw the squirrel, actually wanted to chase the squirrel, is a great thing! I am glad he didn’t catch it. Her dog didn’t have any complications afterwards (jaw, or anything) and has healed great and is now fine. So I am very happy for her. She found out pretty quick what type of cancer her dog had. They are going to do radiation with him. We are still waiting to find out what kind of tumor it was, and what treatment they will recommend. As a former cancer patient myself, I am very hesitant to put him through all that. But if they give me compelling evidence that it will help him – then by all means I will do it. Rocco update: (Sunday afternoon) he got his stitches out this morning! Doc says he is doing amazing, he is healing well. No news on the tumor yet, hopefully by the end of the week. 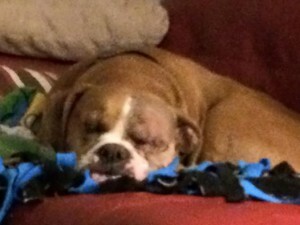 Rocco will stay on his pain medications thru Wednesday, and is still restricted from playing outside unsupervised. His jaw is still sore, so soft food for a few more days. He is resting comfortably, and seems pain free (other than the jaw). He still has not really tried to scratch his surgery area or rub it on anything. Even though the stitches has been removed, if he rubs it too hard or scratches the area just right, he can rip the area where the stitches were. I am SOOOO glad that Lindsey is able and willing to stay with him. I am going to sleep well tonight. I think the weight is being lifted a little as each day passes and he feels better. Its like having a sick child, you feel helpless sometimes to fix things. Just takes time. Chloe has been so sweet to him. He just wants to cuddle with her, and although I know she doesn’t really want to cuddle with him, she allows it. She is the best dog ever! She really is. I know she isn’t feeling great either. She is just getting old and her bones ache. She never complains. She cant hear very well, but maybe she enjoys that. I see her declining the past 6 months or so. Just more days that she doesnt really want to eat, she sleeps a lot more, she has a hard time getting up, she has a hard time walking too far, I think it even hurts her sometimes when she goes out to go potty and her rear legs need to support her. She has the arthritis meds, and I think that helps. She will be 14 in November, which is pretty old for a lab. I sure love her! (Wednesday am). Poor Rocco – his jaw is super sore. He barked and it hurt, he yawns and it hurts, and when Lindsey gave him a cookie yesterday he couldn’t eat it and was yelping in pain. He loves his cookies so I am sure this was very disturbing for him! Called the surgeon and he said it could be from the surgery (they did work very close to his upper jaw), but they want to see him. He also has very dark blackish poops, they said he needs to be seen for that, too! So I took today off. Not sure how long all this is going to take, or if there will be any special care needed. I gave him soft food for breakfast and he gobbled it down, and now he is sound asleep right next to me. Cant this cutie pie catch a break? I feel so bad for him. I know its normal to take two steps forward and one step back after surgery, but I just want him to feel good again! I want him to be able to play soccer outside again, I want him to be his wild and crazy self again! This picture is from before the surgery. Later the same day: Everything is fine! Dr not concerned about the poop, they tested it and it’s just the meds. No blood!! The jaw pain is probably because the ‘mass’ was right above his jaw, so that muscle is probably sore from the surgery. Soft foods for a while. They said to keep him on all the medications for a few more days to help him get past the soreness. Rocco, aka Captain fawn beard, is exhausted from his day out. I think he is tired of going all the way to the valley for the vet visits. He would probably enjoy a long walk around the neighborhood a little more. He loves the car and I dont want him to think every time he goes in the car he will be going to the animal hospital. He really is in good spirits and other than the pain in the jaw seems fine! Thanks to all of you for the ideas and well wishes. We all appreciate your concern. Monday morning: I’ve spent the morning with the pups today! Rocco was in good spirits and very excited to spend the morning with me!! Chloe was excited too! We cuddled up on the couch and then they both fell asleep… So…. Our morning has been a lazy one! I am taking Pirate Fawn Beard (oh yeah, Dad and I changed his name) to the vet in a little while for a check up of sorts, and I will post an update once we get back. I am exhausted, but I see progress and its wonderful that Rocco is healing, swelling is going down, and hopefully soon our life will be back to normal. Later the same day: Rocco is doing really well. He doesn’t seem to be in pain (although he is still on pain meds). He is getting a little more rambunctious. The surgeon said he is coming along just as expected, and is healing quickly! We go back in Sunday to remove the stitches. I think the hard part is over – at least I hope so!! Thank you to Lindsey for puppy sitting while I work. This way he (captain fawnbeard) doesn’t have to wear the dreaded cone. He hasn’t really tried to scratch his eye area, or rub it on anything yet. The surgeon said we have to be really careful if we dont have the cone on him because he said its going to start being very itchy and he will probably scratch it. Until we have the stitches out, that could be BAD news! We do have the inflatable cone that we can put on if he starts acting like its itchy or if he starts trying to scratch it / rub against things. We are suppose to still ice him a couple times a day to keep swelling down. Rocco doesnt seem to mind it, maybe it feels good. Rocco is coming home! I am so relieved – he is doing better! Dr told me that he has been on oral meds now and seems comfortable. He is alert and is acting happy to see people. They are going to get him walking around and eating. He is swollen still, but that’s normal. His incision is scabbing up, so everything now is as expected. Yay! He will have the cone on for 2 weeks which is going to make things difficult – he won’t be able to use the doggy door, but hopefully that will be the only problem. (Except for the bill – maybe we will win the lotto). Later the same day: Rocco is home! He is kind of out of it, a little disoriented, having a hard time getting comfortable, but happy to be home. We moved the crate downstairs, and we have to keep him calm . The words ‘calm’ and ‘Rocco’ are not typically used together. The first couple days will be tough. Pills on different time schedules and I need to put a cold compress in his eye every 3-4 hours. He HATES the cone. Wont even sit down. Just standing there. He is so tired, I can tell. He wont lie down. Whatever it takes! So happy to have him home! 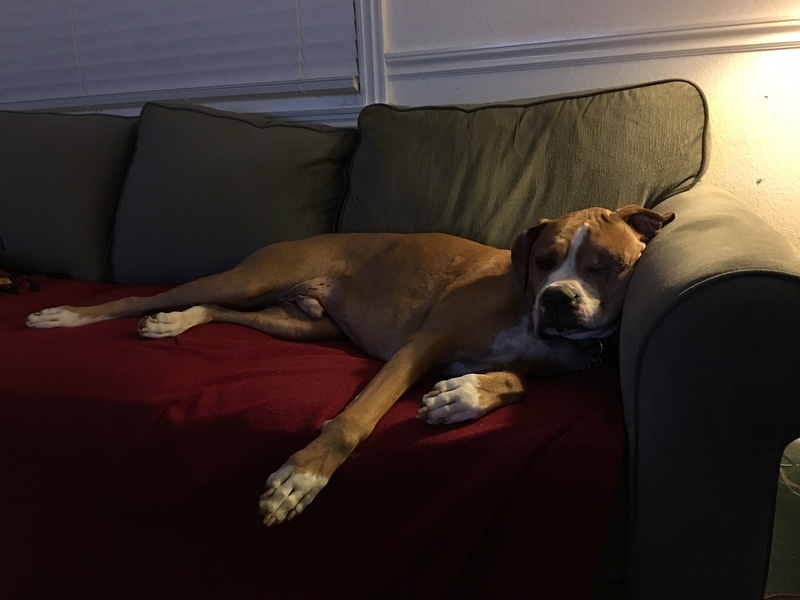 August 9th update: Rocco update (Sunday eve): it was a good day. Rocco seems to be feeling better and better each day. The swelling has gone down almost all the way. Here is a picture of him sleeping. In the bright light it doesn’t look as good as this, but I thought you might like to see him. Hoping for a nice, restful evening. I have to go to work tomorrow. Lindsey is going to babysit Rocco. She is the best daughter!! !